my little red suitcase: things that are making me happy! things that are making me happy! Hello, here is a collection of things which are making me happy and helping me through the month of February! 1. These magical Febuary snowdrops. How I wish I had the know how and camera to capture these shy beauties more clearly! 2. 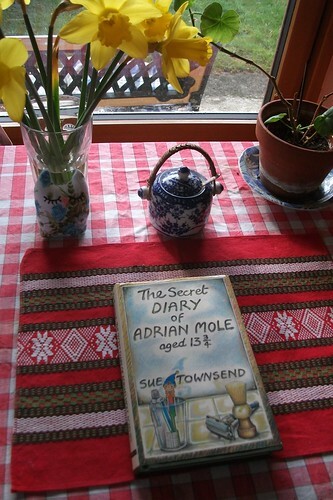 I have been reading 'The secret diary of Adrian Mole aged 13 3/4' . This book is hysterical. Given to me by my Mum at christmas 1983, when I was age 13 2/3..... I'm chuckling to myself now about anyone who is doing the maths......, I always do the maths!....... Do you remember this book? Set during the 1980's, Margaret Thatcher is Prime minister, Ronald Regan is President, and its the year of the royal wedding, Charles & Diana. Adrian Mole has to cope with the life and worries of a 13 year old and it has reminded me of a few things I had forgotten and left me laughing out loud at night. My last post was definitely inspired by this book. 3. Enjoying the colour and crochet. 4. My clear hallway. At last. This area was full of boxes of books. I've finally managed to create a home for them here. After decorating my living room, they felt to heavy to put back there. So I have created this mini library in the hall. It's completely full and I may clear more, but I do love my books, each interest and stage of my life is there and at the moment I still want them, but I want to enjoy seeing them and not hide them away in the loft. So I am enjoying this. The trap door to the attic fits perfectly inbetween, don't you just love it when you find something to fit a spot exactly! I keep walking through now just for fun and because I can! We turned a spare bedroom into a library in our last house, we had so many books that we couldn't part with! Now we have down-sized to Poppy Cottage....and I have a Kindle! But I still have quite a few boxes of books, as yet not unpacked as I have nowhere to put them! Just found your lovely blog. Will stop by again. Oh, and I meant to tell you you took a nice shot of the snowdrops. Remember it's not the camera we use, but the way we look at things that makes a great photograph! Yes, I read that book too. Love books and still have many of mine boxed away awaiting a bookcase ... you may have just inspired me to get into action!! Seu blog está lindo!!! Cada vez que eu visito eu me apaixono mais!!! Pegue o meu selinho!!! E me siga! I know how you feel about the books! I have been trying to relocate the boxed up books that were in the storeroom that is slowly becoming my studio. The two big landing bookcases (one per landing, Knitso Towers is a tall house) are now both stuffed to the gills and I still have two more boxes left to sort. I like your library. We are book hoarders in this house and my "one in, one out" policy is clearing not working! 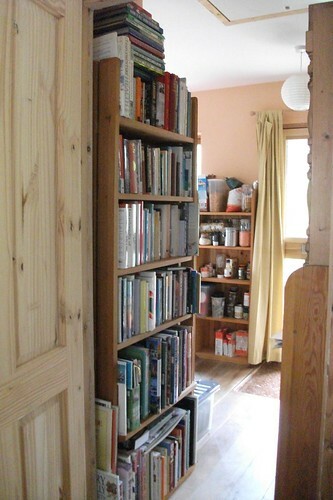 A landing or hall is an excellent place to store some books. Beautiful colours in your crochet, too. 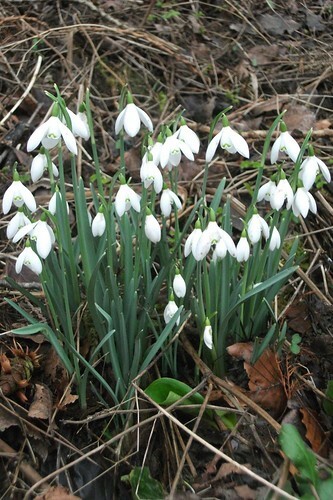 Snowdrops are truly amazing aren't they?! Your crochet is beautiful - such lovely colours. Love your happy things!! Thanks for visiting my blog, that makes me very happy!! and thank you for your kind comments!! Absolutely love your wooden floors!! Flowers! We've been snowed in, here. I've been at home more than I've been at work, we've had so many blizzards. Today is an unexpected day off, due to an ice storm. I'm ready for some spring flowers! That looks like a very interesting granny square project! What's it going to be? Love your bookshelf....I always want to live in a home that has oodles of books...pure joy! I have never read Adrian mole, can't believe that, just read her new one about the women who stays in bed for ayear, really enjoyed that, except for the toilet parts...I'll say no more in case you haven't read it. Yes, I love when something fits perfectly. And I'm happy to see your bookcase as full as mine! I'm always so drawn to the colors in your photos and crochet things. Happy colors. More snow falling here today and poor driving conditions. Spring gardening still happening on my kitchen table. Forgot to photograph the irises and this morning they have passed their prime. Might have to go pick up another pot of them. I seem to haul home second hand books all the time. They can flow, in and out of my life, without the attachment of shelling out major cash for new ones. Love your sturdy looking bookshelf, filled to the max! Each of the above images made me very happy also. Flowers, crochet, daily, a library full of books ... It is all very nice. Have a happy valentine's day.. I just read Adrian Mole! I bought it on a whim for kindle as I remember all the hype about it when I was a child but never read it. I'm just about the same age as you then lol. 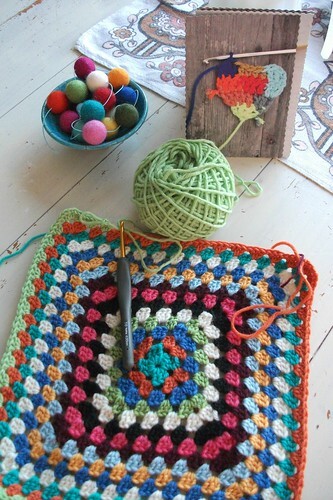 Love the granny square too, great colours.